As promised, here are my woven shibori results! 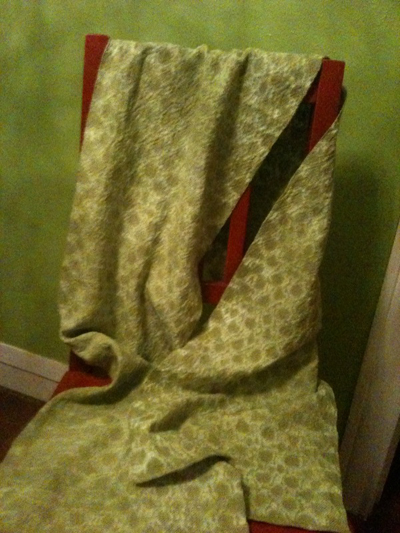 Quite lovely texture and patterning in “Naomi” green. It was such a nice way to end my weaving class. This piece was created with cotton 5/2 yarn. I really liked the other pieces in my class that were created with 10/2 yarn. With the finer thread, the pattern results were even more dramatic. It was a fun filled, fabulous, and a bit of a frenetic first semester. I just took a holiday break with my sweetheart, and am now furiously back to work. I am making messes in my studio and taking advantage of my gift of 14 days before I go back to being a full time grad student/teaching assistant/art history paper writer. I made it! The first semester of my 3 year MFA program at UNT has been amazing and quite a whirlwind. 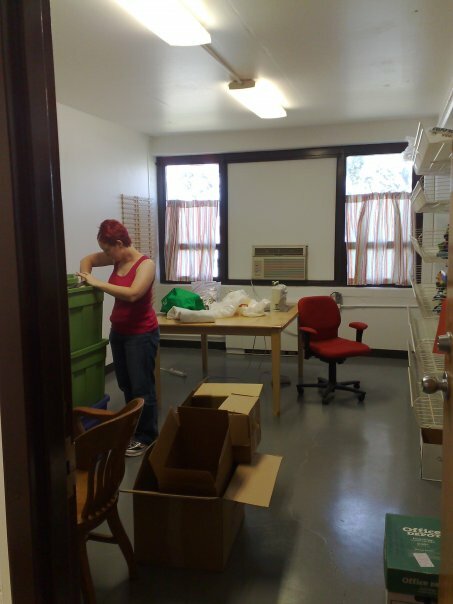 Here are a few photos of the unpacking of my studio space on campus. 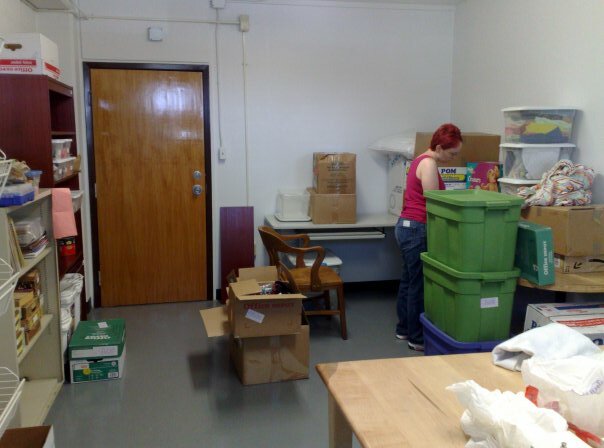 I am fortunate to have a large, private studio space with dyeing facilities and all sorts of other great amenities. I have tackled an amazing amount of techniques and had all sorts of fabulous adventures, many ending with my hands a new and exciting color. Potato and corn dextrin resists, dyeing batting, screen printing, rusting, smocking, devore, flour paste resists, you name it, I’ve tried it this semester. I can’t wait to get to the rest of my list of things to try. This last photo is a piece that is still in the dye bath right this minute. It is a piece of woven shibori, still on the loom. 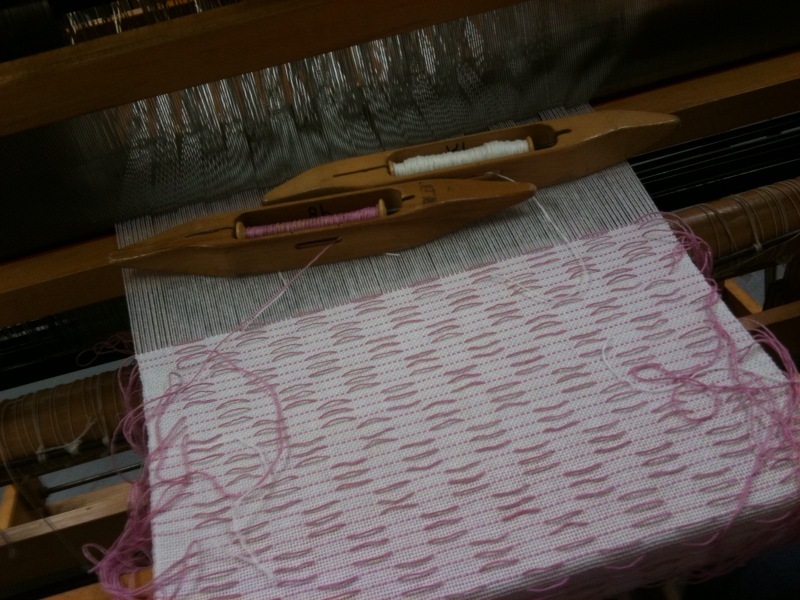 The pink threads are the gathering threads to make the shibori resist, and will be taken out when the dyeing and washing is complete. I’ll get you a photo of the completed woven shibori piece, disaster or not.